It was a “now or never” moment for me. A few days ago, I built up enough courage to ride the Seattle Great Wheel. You may remember my sketches from June, just before it opened. Friends from Chicago were in town, and our sightseeing led us to the base of the wheel. The three kids with us begged to go on it, and before I knew it, we were four adults and three kids boarding the same gondola while a Great Wheel employee pointed out the button we should push in case one of us felt sick or too nervous to stay on board. I was the biggest chicken of all of us, sitting as far away from the doors as I could. After four loops, we sat idle at the top for a while and I pulled out my pocket sketchbook. 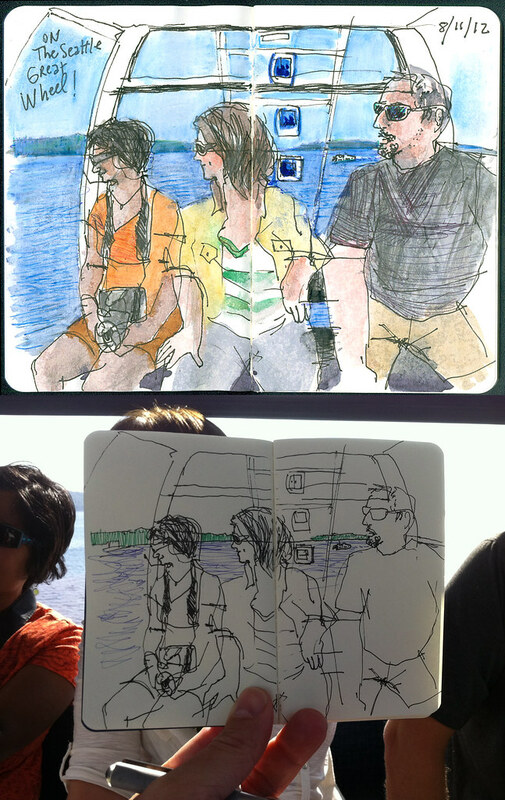 I figured the best thing I could do to keep calm is sketch my friends and the amazing views. I never even had to push that emergency button. Above is a photo of the sketch, which I colored later with Art Grip Aquarelle Faber-Castell watercolor pencils. Have you taken a ride on the Great Wheel yet? What did you think?